A Tourist Demands. A Pilgrim Appreciates. When I answer, I try to focus on the positive. On the surface, it is quite easy to default to a “tourist” mindset and find fault with facilities. For example, a few nights ago I was in Belorado, a tiny town whose center is under renovation, so the normally tranquil square was filled with construction vehicles and scaffolding. Some people (Spaniards, actually) kvetched that it wasn’t beautiful enough. I stayed in a by-donation albergue in a small section of an old church. The stairs to the room were rickety and covered with cracked linoleum, the paint old and peeling, the bunk beds from another era, the bathrooms antiquated. And, in the spirit of the Camino, cell phones were prohibited within the premises. Yet, I was greeted with such warmth by the Swiss volunteer hospitalero, who insisted I sit down, take my pack off and enjoy some freshly brewed tea, that I didn´t mind the relative dumpiness. It had hot water and firm mattresses; after a long day of walking, did anything else really matter? The other guests were also put at ease by the host, and so the general vibe was one of friendliness and cooperation; we shared food and conversation. 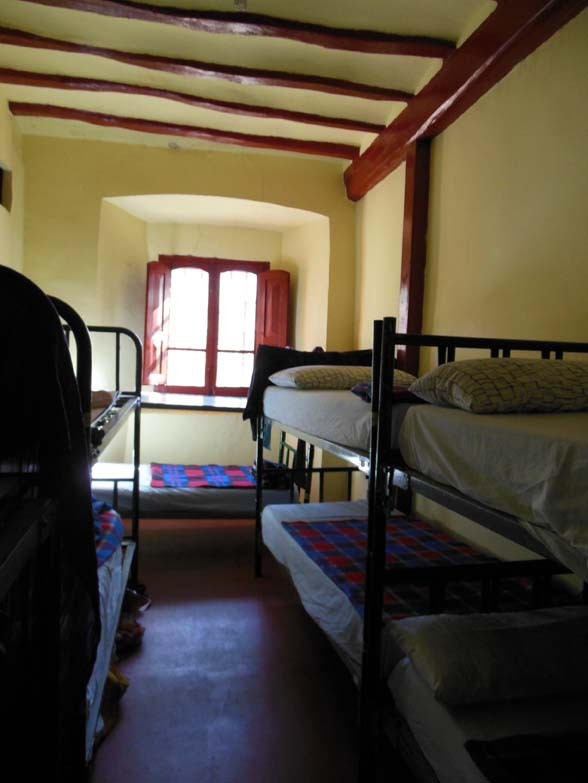 The following evening I stayed in a bright, freshly painted, modern hostel, complete with a leg massaging machine, but the manager acted as if we were necessary nuisances. And since his was the only open restaurant in that small town, we had no choice but to eat there. Normally, I don´t like being a captive audience, but after walking 16 miles I was exhausted and hungry. It wasn’t the time to be finicky. “What are you going to have?” asked my Spanish companions, a woman my age and her father. “Maybe the vegetable soup,” I said. There were not many other choices for a vegetarian. I glanced over and saw steam rising from the bowl. “It’s hot,” I said. That was enough for me. Later, a trio of Italians came in, whom I had been seeing for a few days on the trail. “How is the soup?” they asked, eyebrows raised. Could the gruff hostel owner dish out good food? “It´s hot,” I said and smiled. The rest of the meal turned out to be a pleasant surprise. A huge portion of grilled salmon, a hefty slice of a homemade apple tart. Heaven. Today, eating lunch in Burgos, where I´m taking a rest day, I overheard a woman having a detailed discussion with the waiter about the meat she would be eating. He brought it to the table in a bowl before cooking it and they had a long talk about the cut and preparation, pointing to the various parts of the animal. She was not a tourist, but a Spaniard. I marveled that she took her food so seriously and that the waiter did, too. In many circles, being demanding is a sign of sophistication. To accept what is available, and appreciate it, even, without offering a shred of criticism or analysis, is not always viewed favorably. We could also say that the ego demands, the soul appreciates. Each day seems to be a battle between the two.